Lernabit is a digital notecard app that helps you remember more of what you learn. Just as you would do with paper notecards, Lernabit allows you to create notes and review them later so you remember the information. Just one of the features that makes Lernabit more powerful than paper notecards is the ability to add image and audio attachments to your notecards, which creates some very cool ways Lernabit can be used to help you learn about your favorite topics. Today, I have released a new improvement that allows Premium members to add multiple attachments to their notes. Foreign language is a very popular topic for people who like to learn on their own and it is also a great way to use Lernabit. The ability to add multiple attachments to a note opens up some very cool new ways to learn foreign languages. When learning a foreign language, most people try to learn new words by translating each word into their own native language, and their knowledge of the language is based on their ability to translate back to their native tongue. But this method really isn't the best way to learn a language. A more effective method is to create associations between the word and what it describes. For example, if you are learning Spanish, instead of seeing the word "lápiz" and translating that into the word "pencil", it is better to train your brain to see the word "lápiz" and visualize an image of a pencil. This is how you learned your native language and in the long run it is a better way to learn a foreign language. A demonstration of how multiple attachments can be used to learn foreign language vocabulary. As you can see, I created the card to help me create word associations. I took multiple pictures of different fire hydrants and labeled them with the Italian word, "idrante". Now when I review this note I train my brain to see a fire hydrant and immediately jump to the word "idrante" instead of translating it through English first. In addition to adding multiple images to your note, you can take it a step further by adding an audio attachment too. That helps create an even stronger mental connection to the word by engaging the parts of the brain involved in speech. You can see many images, then hear the word, and ideally repeat the word out loud. By studying that way, and with Lernabit actively helping you remember to study, you can learn a new language very quickly by engaging your whole brain. Like a lot of other nature lovers, I enjoy birdwatching, and one way you can identify birds is by their songs. But most birds have more than one song or call, such as a call used as a warning and a different call made during mating. By attaching different images and audio clips to my notes, I can learn what each bird looks like and what they sound like so I become better at identifying each species. Note attachments can help you remember more of what you read. When you find something interesting in a book, you can take a picture of it and save the image in Lernabit. With multiple attachments, you can take advantage of this technique even when the part you want to remember spans multiple pages. Just take a picture of each page and attach them all to the same note. The attachments will stay in the same order in which you save them so the pages stay in order. Then when you review the note you can reread the book excerpt and continue to remember it. When learning about topics that involve a lot of math, you can draw the equations on paper, take pictures of them, and attach them to your notes. You can do the same thing with diagrams and flow charts. Alternatively, if the diagram is created on your computer, simply take a screenshot of the diagram and attach it to a note. While making changes to the Android app to allow multiple attachments, I also took the opportunity to make other changes to attachment handling in the Android app. When an image attachment is uploaded, it will be resized into multiple different sizes. Lernabit has already been doing this for a long time, but now there are more sizes available so that when the app or website loads attachment images, the best size will automatically be selected to strike a balance between data usage, image load time, and image quality. One of the problems with image loading in the old version was that it created problems with scrolling. While scrolling through a feed, images would load and interfere with scrolling. On slow network connections it was even possible to scroll through before the image loaded and not even realize there should be an image. This has been fixed by adding a placeholder image that will show immediately while the real image loads from the server, creating a much better scrolling experience. Note attachments are a great way to remember more of what you learn. Now that you can attach multiple images and audio files to a note, Lernabit is more powerful than ever. Upgrade to Premium now to start adding multiple attachments to your notes. 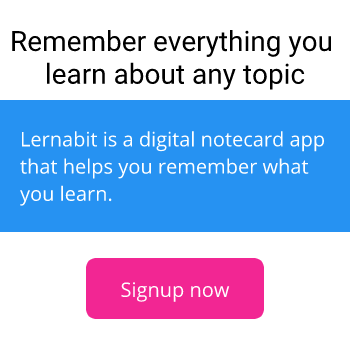 Create your free account now and start using Lernabit to remember more of what you learn! Check out some new changes to Lernabit that help you remember what you learn more efficiently than ever.